The DS9092L+ iButton probe with LED provides the electrical contact necessary for the transfer of data to and from the DS19xx family of iButtons. The round probe shape provides a self-aligning interface which readily matches the circular rim of the iButton's MicroCan package. The solid metal contacts resist wear and are easy to keep clean. The DS9092L+ has no moving parts, making it a rugged interface for harsh environments. The round center contact of the DS9092L+ houses the LED which is rated for maximum 20mA DC at 2.7V typical. The probe comes with a brass M18 x 1 nut for panel mounting. Since the body of the probe also forms the ground contact, the panel should be of non-conducting material to avoid ground loops. 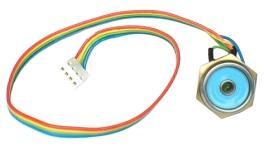 The 30cm cable with connector is provided for easy connection to the system microcontroller.